A 90-second daily show highlighting the songs of British birds has started on BBC Radio 4 this week. But birdsong isn't just beautiful to listen to, it is increasingly being used in surprising ways. Can a nightingale's song help you pass an exam or a blackbird's twittering encourage you to open a bank account? Sound experts are using it to do both. They argue the positive results speak for themselves even though researchers say there is little hard scientific evidence to show people respond positively to birds singing. Most support for the theory is anecdotal. So what are the innovative ways it is being used? Far too often noise can make it hard to concentrate, be it a loud television, loud traffic or loud people. But audio experts say certain sounds can make it easier to focus and they include birds singing. What makes birdsong so special is that it relaxes people physically but stimulates them cognitively, says Julian Treasure, author of Sound Business and chairman of noise consultancy The Sound Agency. Birdsong creates a state he calls "body relaxed, mind alert". "People find birdsong relaxing and reassuring because over thousands of years they have learnt when the birds sing they are safe, it's when birds stop singing that people need to worry. Birdsong is also nature's alarm clock, with the dawn chorus signalling the start of the day, so it stimulates us cognitively." Treasure has used birdsong to develop a free smartphone app called Study. It claims to be a "productivity-boosting" soundscape to listen to while you work. It can help focus, improve cognition and reduce tiredness, Treasure argues. It's also designed to mask background noise that can disturb concentration, particularly conversation. The effect of birdsong on our brains is being researched by Eleanor Ratcliffe. She is carrying out a three-year study looking at how natural sounds can improve mood and attention for her PhD in Environmental Psychology at the University of Surrey. The research is part funded by the National Trust and Surrey Wildlife Trust. 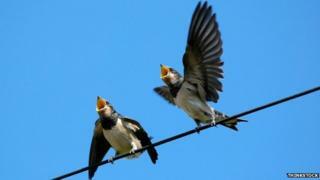 "We need to find out if, how and why birdsong can be of psychological benefit. Many people believe it is," she says. The nightingale has probably the most celebrated song, with John Keats describing the bird pouring forth thy soul abroad in such an ecstasy! in his 1819 Ode to a Nightingale. Samuel Taylor Coleridge's 1798 poem The Nightingale reads: And hark! the Nightingale begins its song. "Most musical, most melancholy" bird!... so his song should make all Nature lovelier, and itself be loved like Nature! William Wordsworth wrote the skylark's babbling song dost pour upon the world a flood of harmony in his 1805 verse To a Skylark. In the science world it's known as postprandial somnolence but in the everyday world it's commonly known as the post-meal slump. It's the period after a meal when blood sugar levels drop, causing you to get sleepy. As an office bed and sanctioned afternoon naps are not likely solutions, researchers are looking into what can lift people out of this soporific state after lunch. Birdsong has been found to work, they say. An experiment at a primary school in Liverpool - run by "sonic branding" company Condiment Junkie, Glyndwr University and architects Nightingale Associates - found that playing pupils a soundscape of birdsong and other natural sounds made them more alert and better able to concentrate after their lunch break. The key to the most effective audio was lack of repetition, say those involved. Birdsong works because it's stochastic, made up of lots of random sounds. There is no repeating rhythm or pattern to focus on. "It doesn't get stuck in your head and annoy you but it doesn't lull you to sleep and bore you either," says Russell Jones, from Condiment Junkie. "I'm not sure there is any other sound that can do what birdsong does. It should be part of the soundtrack to everyone's day." When you walk along the corridors of Alder Hey Children's Hospital in Liverpool among the noise of everyday hospital life you will hear birdsong. Patients recorded the sound of birds in a local park as part of a project with the Foundation for Creative Technology (FACT) and award-winning wildlife sound recordist Chris Watson. The aim was to explore how bringing the outdoors inside one of the largest and busiest children's hospitals in Europe might provide an uplifting and therapeutic experience for patients. Watson created a shortened version of the dawn chorus called Wild Song at Dawn which patients and staff could also listen to on a personal audio player. The recording was used to calm young patients as they received injections and other treatments, with positive results. "The children find it very calming and it can help them de-stress before undergoing treatments or surgery," says the hospital. Recordings of birdsong have now been installed in corridors and CDs of the dawn chorus are available for patients to play at home. While few scientific studies have been done on people's particular response to birdsong, research has established the restorative effects of natural sounds in general when it comes to stress. Studies have included prescribing woodland walks to combat depression and treat heart problems. But birdsong is also being experimented with in crowded places where noise levels and anxiety can be high, like transport hubs. Amsterdam's Schiphol Airport uses birdsong in a quiet lounge where people can relax before their flight. Along with other calming methods birdsong is played through speakers hidden in real trees. Last month the airport was voted the third best in the world at the World Airport Awards and last year 95% of passengers rated it as good or excellent, according to Schiphol's own figures. Such projects try to use native birdsongs as they think they will be most successful. Ratcliffe is looking at responses to different birdsong and, depending on the outcome, it's a possibility that in the future people could be prescribed certain bits of birdsong to suit their individual needs. "It would be nice to say to people these are the best birdsongs for you," she says. The National Trust suggests people listen to birdsong for a few minutes a day to combat low moods. Sound expert Julian Treasure agrees. "It resets the ears, allows us to hear properly. Most of us walk around with our ears switched off because so much noise is unpleasant. Unlike so many other sounds there's no maximum exposure to birdsong." Treasure worked on one project in Colombia to rebrand a bank. As well as the visual side of things, a soundscape was also created that included birdsong. The rebranding resulted in a "dramatic uplift" in people opening new accounts and customer approval ratings rose from 64% to 90% in just six months, says Treasure. BP also used birdsong when research revealed toilets in its petrol stations were having a negative effect on customers' feelings about the BP brand. A strategy was drawn up to improve the toilets including, among other things, a birdsong soundscape. The aim was to create a mental connection with freshness. The scheme was piloted at BP services in Cambridgeshire and across Europe. Customer satisfaction ratings rose by 50%, says Treasure. "Architects need to start designing for our ears as well as our eyes," says Treasure. "Businesses also need to recognise its importance. Good sound is good business."